The Colorado State University Tropical Meteorology Project, which has been tracking tropical storms in the Atlantic for about 30 years, projects that the 2018 hurricane season will be slightly more active than usual.1 This storm season will follow in the footsteps of a devastating 2017, which included notorious storms Harvey, Irma, and Maria. Sadly, every hurricane season carries plenty of potential for danger. And although forecasts may be helpful, it is virtually impossible to predict when a powerful storm could head your way, even for the experts. That's why it is important to have an evacuation plan — and appropriate insurance — in place at all times. Hurricane season officially begins June 1 and continues through November 30, so spring is the time to prepare for the possibility of a major storm. Here are some tips to help your family evacuate safely with the things you need most, and to ease the recovery if your own home suffers damage. If a tropical storm is approaching, cover the outside of windows with plywood or shutters and put away items that could become airborne and damage property. If flooding or a storm surge is expected, consider using sand bags to help keep water away from your home. Stock enough nonperishable food to sustain your family for several days, one gallon of water per day per person, and additional supplies of prescription medicines, diapers, and pet food. Create a portable emergency kit that includes flashlights, batteries, first-aid supplies, and a battery-powered radio. Keep in mind that portable generators, which emit exhaust that may contain deadly carbon monoxide, should always be run outdoors. When dangerous conditions are forecast, NOAA weather stations or local broadcasters may issue emergency or evacuation instructions. In some parts of the country, a reverse 911 call might notify you that your neighborhood is subject to an evacuation order. Because you may not have much notice, it's wise to plan ahead regarding where you will go and what you will take with you if you must evacuate. Keep your automobiles fueled and ready; you may have to leave in a hurry and might not be able to buy gasoline if the electricity is out. Make travel arrangements. Will you stay with friends or family in another town or head to a hotel or a community shelter? Map out a route to your destination, as well as an alternate route to take if roads are blocked or impassable. Identify a safe place to meet and designate a family member who lives in another area (such as out of state) to serve as a point of contact in the event that other family members become separated. Write down a list. Remember to include your portable emergency kit; medical supplies and prescription medications; bottled water; clothing and bedding; your computer hard drive or laptop; cell phone and charging cord; eyeglasses; photos; and special food or other items for children, disabled or elderly family members, and pets. 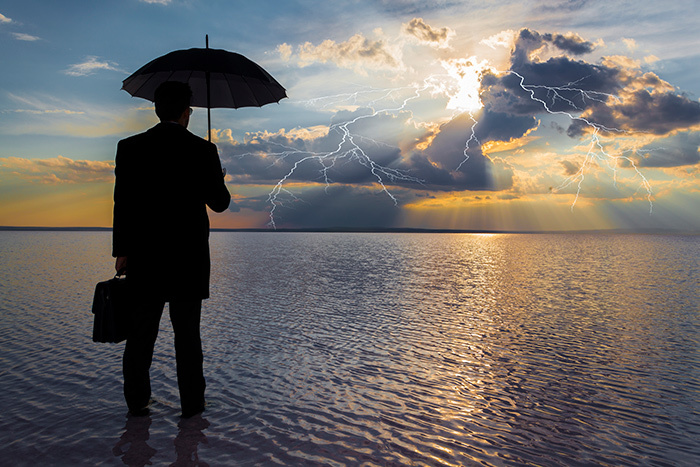 After a storm passes, your insurance coverage can help get your life and home back to normal. Standard homeowners policies typically cover damage from wind and wind-driven rain, up to policy limits, and often have a flat deductible such as $500 or $1,000. A deductible is the amount a policyholder must pay before insurance coverage kicks in. However, in many coastal regions, a hurricane may trigger a specific deductible that is set as a percentage of the policy limits (usually ranging from 1% to 5%). For example, if a property is insured for $200,000 and the policy has a 2% hurricane deductible, then the first $4,000 of repair costs must be paid by the homeowner. The triggers that determine whether a hurricane deductible applies to a claim vary by state and insurer; they may go into effect when the National Weather Service officially names a tropical storm, declares a hurricane watch or warning, or defines a hurricane's intensity by category. Residents of coastal states should take a close look at the declarations page of their homeowners policies and talk to their agents if they have questions about the hurricane deductible. If your property is subject to flood risk, consider purchasing a separate flood policy. Flood coverage may be available from the National Flood Insurance Program or, in some cases, from private insurers. Information about flood insurance is available at floodsmart.gov. Along with considering specific coverage for hurricanes and floods, it's important to review your insurance policies periodically to assess whether you have sufficient general coverage. Your home and its contents should be insured to their full replacement cost; otherwise, it could prove difficult to rebuild the structure at current market prices. If you have remodeled your home or bought new furnishings, remember to notify your insurance agent so that the higher value can be reflected in your policy. Also check your coverage for additional living expenses (ALE), which would help pay for living costs while your home is uninhabitable or being repaired. Policies typically provide ALE coverage for 20% of the amount of coverage on your house, and the expenses might be covered only for a specified period of time.